My original 2015 resolutions involved getting rid of things: debt, clothing, stuff I don’t need, and organizing: a novel/thesis draft, submissions, all the stuff I have accumulated to prove I’m alive and staking a claim in this world. I failed at most of this stuff (I did okay with the submissions and novel/thesis draft, but we’ll get to that later). 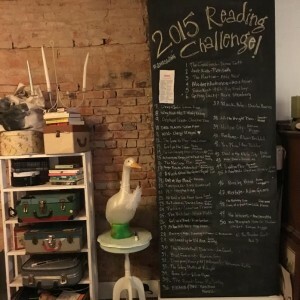 But then, sometime in late January, a friend posted a reading challenge on her Facebook page and that was it. I clicked, and it clicked. And just like that, my 2015 was to be about reading. And why not? Writers should be reading. Consuming every word they can, good or bad. Instead of consuming calories, or new outfits to stuff in already full closets and drawers, (and let’s be honest floors, 2016 is another year. Insert embarrassed emoji here) I made the decision to read 52 books (fifty categories, one of which was a trilogy). Using this list, Pop Sugar Reading Challenge, I set out on my resolution. I prepped my chalkboard wall and stacks of books. I noted the books I’d already read since January 1, planned a few, dreaded a few, and got reading. Then, in February, I roped another friend of mine into joining the challenge. Convincing her took all of three seconds. Her book nerdiness surpasses mine by pages, trees even. Having a partner in book crime helped me to hashtag amreading even more. She suggested books, we texted ideas, encouragement, and even some warnings about horrible books to avoid. Later in the year, she invited me to join her book club. In all of my years as a reader and a writer, I have never been in a book club. Sure, literature focused courses feel like a book club (without the wine and with more scholarly papers), but they lack the best part of a real book club, the absolute desire to come together to talk about a book, or at least talk to a group of people you love in the name of a book. Or maybe your book club is dumb, in which case I suggest you get a new one. This group of women (wait, are their book clubs full of men? That’s going to have to be another post entirely) is inspiring and make me want to read with a higher level of intensity. They even did me the solid of reading my novel draft and giving me valuable notes. The book club encouraged me to read even more books out of my comfort level, making me read Vonnegut again. I still don’t love him, but Timequake was probably not the best second Vonnegut book to read. I promise to keep trying, but I think I love his quotes and one-liners more than most of his writing. Sorry. The challenge had pseudo guidelines of what to read, with a list of specific books to read, but I was able to curtail them to my reading preferences in most cases. In other cases, I was pushed out of my comfort zone, mostly for the better. Because of the challenge, I began to tackle authors that scared me either for their reputation of being fantastic, cult, or maybe over my head. I surprised myself so many times in 2015 with so many novels and authors. I was refreshed. And I think my writing started to change a little. I grew confident in my revisions of both my thesis draft and my other writing. I will say that new writing/creation was lacking a bit, but I submitted almost weekly with two successful publications and two encouraging (and lots of form) rejection letters. After April, I put the manuscript aside and kept reading, only writing poetry. I think this helped me tremendously because in the fall I took part in a brilliant class at Rosemont, Editing the Novel Length Manuscript. There I was paired with a young editor in the publishing program. Her suggestions (some of them the same that others had given me in the past) made so much more sense to me. I was ready to hear them and implement them, finally. Editing felt almost natural. During the challenge I read both as a reader and a writer. I fell in love with strings of words, but also studied them for structure, character development, format, setting, etc. I also read what I like to call “puffy” books as my escape from reading as a writer. These books include celebrity memoirs, comedic books, and even some YA, though most of the YA I read were just as good if not better than some of the bestsellers I read. Ahem, Orphan Train and The Boston Girl. I’m looking at you with our gimmicky structures and flat narratives. You can see all the books I read here, or in tiny print below. This past weekend, I met with my reading challenge partner and we discussed our list. It took us almost four hours, and we rushed the last ten or so categories. One by one we told each other what we read and how we felt about each book. We overlapped a few times, but mostly read different books. We came up with a bunch of ideas to rate and analyze (nerd alert!) the last year: top five best lines or quotes from a book, total number of pages read/hours listened, top ten favorite books, the five (ish) worst books, best settings, female to male author ratio, favorite openings, longest and shortest books, best audiobook/narrator, books we both read, etc. This is going to take me some time to compile and narrow. For now, here’s my top ten list of books I loved, and the list of books I didn’t love so much. I’ll save the full analytics for the next blog. The Bell Jar– Sylvia Plath Why had I never read The Bell Jar? I mean, I listened to The Cure; I wore lots of black eye makeup, and wrote poetry as a teenager. This should’ve been a staple of my youth. I wonder what I would have thought about it then. I wish I could go back in time and make my teenage self read it and then have a discussion with her. Fahrenheit 451– Ray Bradbury Same with Fahrenheit 451, though I swear I wouldn’t have appreciated the insanely gorgeous strings of words the way I did this year. This will be a definite reread. I totally thought I would never, ever, ever read Ray Bradbury. His name to me meant science fiction, Star Trek, a level of nerd I am not. I was wrong. Wild– Cheryl Strayed Wild surprised me so much. Not that I expected not to love it, I knew I would, but some of the content was surprising to me in that it was a much more powerful than I had expected. I both listened to the audiobook and read it. (No, I will not argue the validity of audiobooks with you. I listen the way I read. If you don’t, fine. I also always try to own a copy of the book so I can go back and forth, with the exception of those puffy books I mentioned above. If you love audiobooks like I do, woo-hoo you.) I finished Wild as an audiobook while walking dogs (hey, that’s my job) on the icy streets of Philadelphia. I began to weep openly on the sidewalk as if I myself had walked the PCT. I listened to that book during the deepest, coldest days of the polar vortex of January 2015, which was so fitting. It resonated with me so much, as I can tell it did for most of the people who read it. So good. The movie, too. Read it if you haven’t. Now. Go! The Game We Play– Susan Lanier This was supposed to be my book chosen for its cover. I went to The Spiral Bookcase to see a friend read with her MFA class at Arcadia. I saw this book on an endcap and was instantly drawn to it. Something about the bold, pink letters screamed at me. Maybe it reminded me of a Wes Anderson movie. Maybe I just like pink. Whatever it was, I bought the book, which turned out to be a signed copy. Bonus. I used the book as my short story collection in the end, but it was neat to support an independent bookstore and an up and coming author. I cannot recommend this book enough. It was one of the collections that made me want to be a better writer. The writing was refreshing, so youthful, so well crafted and fun at the same time. Siddhartha– Herman Hesse Siddhartha was a recommendation from a friend, but I used it as the “originally published in another language” slot. I was sure I wouldn’t get it. It did take me a few rereads of the first five to ten pages to get into it, but once I did, boom. I finished it and immediately started to see the philosophies in the book in everything, including the new Star Wars movie. See? Everything. This was my first attempt at Hesse. I remember in high school a girl I didn’t like said her favorite book was Demian. I thought she was smarter than me for reading that book and I hated her for it. It put a weird shade on Hesse for me that made him inaccessible. No longer! I am free of this misnomer and will go forth and read with abandon. I still don’t promise I’ll understand it all, but now I’m okay with that. The Goldfinch– Donna Tartt I mean come on. These characters were so rich and fun and sometimes not so fun to follow. I was sad when it was over. I loved spending time with these characters and this story. We Need to Talk About Kevin- Lionel Shriver Okay, first off I kept picturing the author as Liev Schreiber, which kind of made reading this more fun. Once I researched the author a little I got Ray Donovan out of my head and realized Lionel is a woman. My friend Jody recommended Kevin to me. I decided to use it as my “a book that scares you” and man alive did it ever. This book was basically a woman writing with total and brutal honesty about a decision to have a child and then what happened when she did. Yeah, terrifying. If you don’t know the ending I won’t spoil it for you. Everyone should read this book. Parts of it felt like reading my own diary or confronting my innermost thoughts, while other parts felt like a horror story. Put this on your 2016 to read list if you haven’t read it already. The movie was good, but the book is way heavier. The Road– Cormac McCarthy McCarthy was another one of those authors I thought I wasn’t smart enough to read. Wrong again. Thanks, challenge, you’ve shattered so many myths for me this year and made me so much more confident in my reading. This book is heartbreaking, but amazing. Eleanor & Park– Rainbow Rowell Set in the 80s with a focus on punk rock and high school? I’m in! I see what all the Rainbow Rowell fuss is about. It examines love, youth, and hurt from both gender perspectives. I cried when it was over. I really only had nine absolute favorite books. There were others that I liked quite a bit. Bird by Bird, Out of Her Mind, Purity, A Visit From the Goon Squad, and even Gone Girl, but I don’t think they are list worthy. I’m picking the non-fiction book I read instead because I am hopeful that it will help me change my life and live up to my original resolution of getting organized and decluttering. I also chose this book because it will help me to rid myself of the remnants of my last blog where I ended up with more clothing than any human should ever have. Haven’t read it, here you go. I wore a different dress every day for a year. Abby’s Dress Blog It’s only mostly embarrassing years later. The Life Changing Magic of Tidying Up– Mary Kondo It’s a little hokey. I’m not gong to lie. I rolled my eyes more than once. I will probably never talk to my clothing or electronics as she suggests. I already talk to animals entirely too much. I have yet to get all of my clothing into one room so I can sort it all into joyous and not so joyous piles, but I have great intentions of doing so. In order to pile my clothing into one room I think I have to do an initial purge. So far I have six bags to donate. (Donate your stuff here, folks). She suggests you also rid yourself of books, but does give one out—if you are an author or researcher you can keep your books. That’s right, Mary, I’m an author. You can pry my books from my icy, deceased hands. I’ll probably get rid of a few though. See Below. Devil in the White City– Erik Larson This is two books and in my opinion they don’t so much go together. It probably doesn’t help that I have a serial killer obsession and already knew the HH Holmes story. While both stories were well researched and written, I found the presentation boring and forced. Bad Feminist- Roxanne Gay This one straight up pissed me off. I had HIGH expectations for this book and it let me down. Hard. So many people I know loved this book. The first few essays had me like fist pump, hell yeah, preach it, but then the middle of this book made me want to gouge my eyes out with a spoon. The middle is comprised of “critical essays,” or ahem, recaps of television shows, books, articles, and movies including a ton of spoilers. The writing was lazy and boring. In a workshop I would’ve said, flesh this out, push this, get honest with this essay. Every time Gay challenged herself for being a hypocrite she did so with one sentence and then immediately started the next essay. What? She constantly contradicts herself, which is fine, human even, but maybe explore your own thoughts and actions while condemning others for theirs. This could have been a powerful book of essays, but it fell flat. The Boston Girl– Anita Diamant How did this get published? Seriously? Oh and then it was a bestseller? Cool. This was my first real book club book and I was scared that everyone was going to love it and I was going to the annoying contrarian. Luckily, we all thought it was garbage. Orphan Train– Christine Klein Another bestseller with a nostalgic narrator that helped me realize what I don’t want to do with my own writing. So, it was useful at least. Timequake– Kurt Vonnegut Please forgive me, Vonnegut lovers. Or don’t. I don’t care. This book was published because it was his last book, not because it was good. Disconnected, rambly, hard to follow, not my thing. I’m going to read Cat’s Cradle this year and try one more time. If I don’t like that one, that’s it. I’m out of the Vonnegut game. Jess and I have decided to participate in the challenge again this year. Unfortunately for us, the list was only 41 books. Not good enough. So, we added our own categories to make it an even 52 just like last year. Feel free to join us, or do your own challenge, be it five books or fifty. Happy Reading! Extra Books for Super Nerds! Okay, this time I’m doing it. Send me texts and hold me accountable, please. Considering the massive stacks of unread books I’ve accumulated, I’m sure I can find one for each of these categories. Or I could use this list as an excuse to buy more books, which is probably what I’ll really do. I love The Road, but it seems like everyone I recommend it to doesn’t feel the same! Great post! Thanks for sharing your reflections. I’ve been tracking my books on GoodReads for… wow, about four years now. Last semester of full time classes coming up so I’ve got a lot of assigned reading, but trying to mix it up with different genres and lots of novels that I’ve always wanted to read. Buddy system is a good idea. Yes, it’s definitely harder when you’re in class with so much assigned reading already. Are you going on to grad school or traveling more?